1953 was Segura’s greatest year. While Francisco Segura was striding through tournaments as the highest ranked pro player, a shadow began to haunt his progress. At the end of I953, perhaps the greatest of Segura's three great years on the tour, that shadow turned into a reality. Richard Gonzales had paid his dues was about to claim the crown from his compatriot. In I954, Gonzales seized the limelight and never let it go. For a long time now Gonzales had also been known as Pancho. Like Segura, he was a Latino, dark-skinned, from a family born across the border. Didn’t all gringos call people like that Pancho? He was "Big Pancho" and Segura became "Little Pancho." But while Segura did not mind the name, Richard Gonzales minded a lot. He thought it insulting. It epitomized the attitude whites had toward him and all Latinos. Beneath the condescending name, he saw hostility and mistrust. He was not wrong. 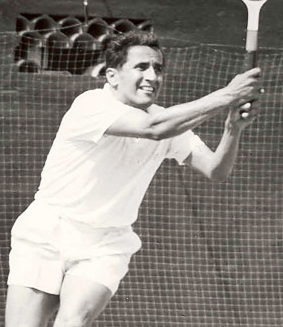 The first year of Gonzales's pro tour, he was traveling in a car with his brother, Manuel, plus Segura and Dinny Pails from a tournament in Dallas. He had just learned that his son Michael had been born. A celebration was in order. They picked up some beer and started the long trip to Shreveport, Louisiana, where they were to play next. A few miles outside Dallas, Big Pancho wanted to stop at a small roadside diner. The four men went inside to eat. The waitress ignored them. Unaware of the three white men sitting at the counter, Gonzales called out to her for service.